More Nikon D700 leaks with pictures! Late last night after my meeting, I managed to catch Eugene’s site on this bit of news. 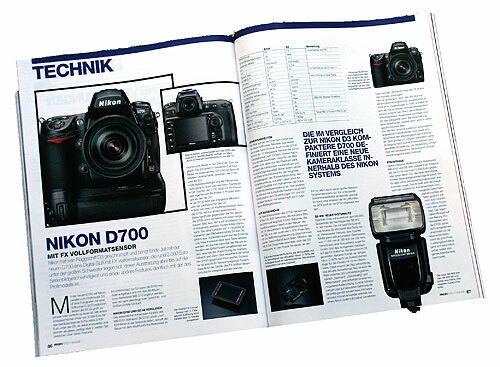 Today I found the site that reportedly published the Nikon D700 and the new SB-900 (new flash unit) will be out at the end of July. Mind you, its in a different language (German if you can understand it) but its Google translation to the rescue! After Nikon with the full-format camera D3 in August 2007 is the first Nikon model with full small image sensor-Formar 24×36 mm that was now follows is not entirely unexpected, the D700. Derselbe 12-Megapixel-Sensor, augenscheinlich dasselbe 51-Punkt-Autofokussystem, etwas geringere Serienbildgeschwindigkeit (5Â B/s statt 9Â B/s – allerdings kann das mit Batterieteil auf 8Â B/s gesteigert werden), Sucherbildfeld 95 statt 100 Prozent, dafÃ¼r aber ein eingebauter Blitz (auch zur Drahtlos-Blitzsteuerung), ein Sensor-Reinigungssystem (dazu morgen mehr) und ein interessantes Preisschild: knapp 2600Â Euro soll die Neue kosten und ab Ende Juli 2008 erhÃ¤ltlich sein. The same 12-megapixel sensor, apparently the same 51-point autofocus system, slightly lower image speed serial (5 B / s instead of 9 B / – however, the battery part to 8 B / s increase), the viewfinder field of 95 instead of 100 percent, but but a built-in flash (also for wireless flash control), a sensor-cleaning system (more about this tomorrow) and an interesting price tag: just under 2,600 euro, the new costs and from the end of July 2008 will be available. Next is a flash Nikon SB-900 as a successor model of the SB-800, whose zoom reflector should be directed to focal lengths from 17-200 mm and in DX and FX sensors recruits, and in which the user firmware updates for the first time in a Nikon Lightning can even aufspielen. Now, the first thing in people’s mind would be, “Is this another rumour?”. Well rumours tend to be true most of the time but upon closer inspect of the image on the magazine, you can see that one of the newer characteristics of the D700 is the viewfinder. Seems different from all of the other DX range of cameras. So this is the best piece of news since they even mentioned that it will be out late July, perhaps a pre-empt strike against the upcoming Canon 5D MkII? Who knows but for one thing, everyone is waiting for the release of this baby. Previous postD700 rumour was a fake?? ?